Thank you for visiting Stamping Peace. 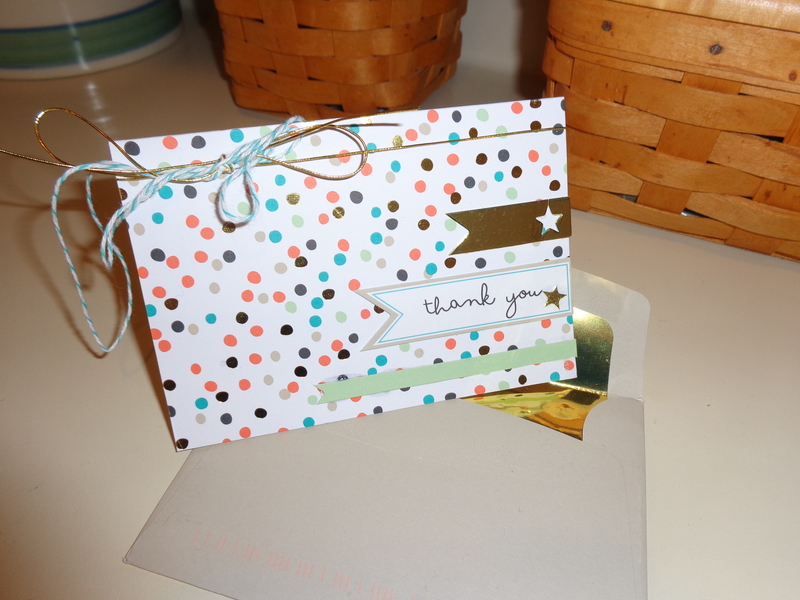 This little piece of shininess was made by my niece and is from a kit offered as a free product for Stampin’ Up!’s “Sale-A-Bration.” All the little dark dots and the dark banner in the picture are actually gold, so you can’t really see how cute it is…it’s small, too (3 1/2″ x 5″), which adds to the cute factor. 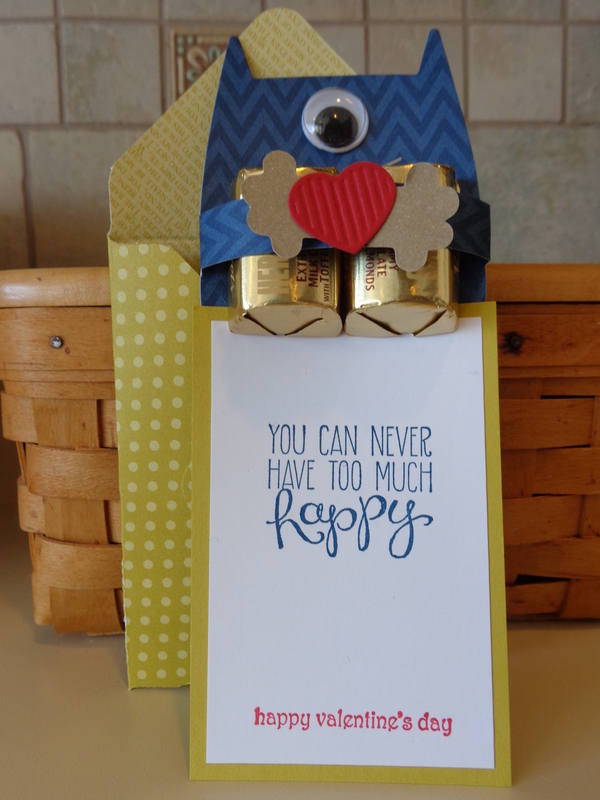 : ) The “Good As Gold” kit comes with all the pieces to make 8 cards…a great choice for our freebie! (Clicking on the picture will enlarge it). SHOP – We can choose one of the exclusive products offered with each $50.00 purchase. (Stamping Peacers…your Sale-A-Bration catalog is in with your January order). HOST – Hostesses earn $30.00 extra hostess dollars with a qualifying party. Today’s card, which is a variation of a Beth Beard design, uses some of the products available for free with a $50.00 order. 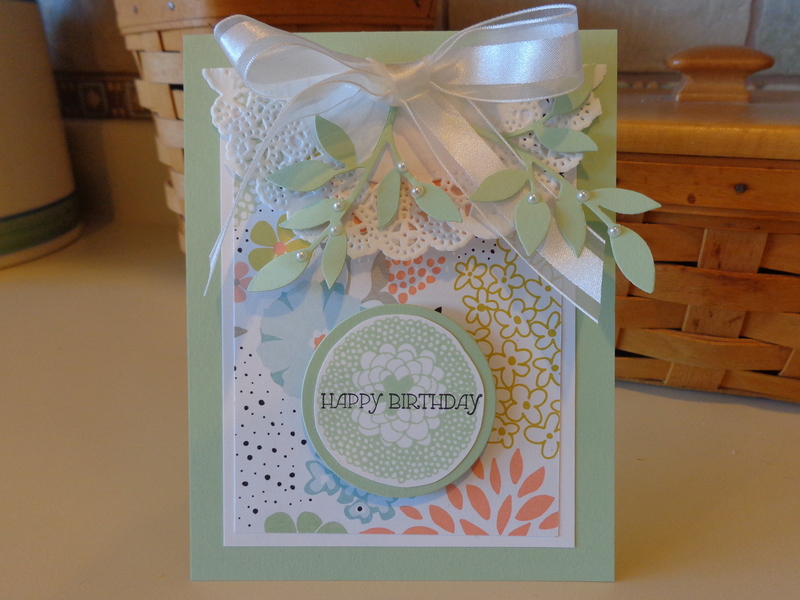 The flower stamp on the front of the card is part of the “Petal Parade” stamp set (5 stamps), and the designer paper is one of 12 pieces of double sided 12″ x 12″ “Sweet Sorbet” paper. Sale-A-Bration is a great bargain all around! Happy Birthday Josh! Twenty four years ago today I had a baby. : ) When he was 16 wks. in utero, I had an AFP test that indicated a problem. An ultrasound discovered that his bladder was ten times the size of his head and arms and legs couldn’t be seen. Our doctor advised abortion. We went to a neonatal specialist from Brown University and he also recommended abortion. He said the baby would either die before birth or within four days of birth from renal failure. The baby had a blockage in his bladder, had drunk all the amniotic fluid (which is normal) and it couldn’t get out. I came home from that appointment and sat on our cellar stairs and cried while Tim was giving Jonathan a bath. As I sat there, it came to me that the baby’s name was Joshua. I went and got the baby name book and looked it up. Joshua means “God saves.” I went into the bathroom and told Tim that the baby’s name was Joshua. When Josh was born, on a Superbowl Sunday, he was 5 1/2 weeks early, but weighed 6 lbs. He was born with Prune Belly Syndrome, which meant no stomach muscles and a bladder that didn’t work. A medical team was flown up from Boston, they took him by helicopter and two days later he had double ureterostomies (two holes in his stomach for urine to flow out of). At age 5 he had the holes closed and had a stoma in his bellybutton, through which I catheterized him every two hours around the clock for 9 months. After that, his bladder worked! : ) At age 9 he had a kidney transplant because when he was in utero and had drunk all the amniotic fluid, it had backed up through his ureters and damaged his kidneys. But today, at age 24, he is healthy, working full time and has a lovely girlfriend. Yay, Josh! : ) That is him, in the picture above, on a beautiful scrapbook page that I made at my friend Beth’s stamping event last week-end. We used the Festive Flurry Stamps and the Let it Snow stamp from the “Best Of” series of stamps. Thanks, Beth, for the gorgeous project, and again, Happy Birthday Josh! Quick story…we stayed at Maine Maritime Academy Friday night with the Boy Scouts…250 men and boys, and me…did I ever feel safe! (Actually, I did see two other women at one point.) Everyone was bunked down in the field house with sleeping bags. The lights went out at 10:00 p.m. On went all the boys flashlights and a lot of chatter for about 30 mins. It got quiet and then one troop started singing “Silent Night” very quietly. At the end of the song, all of the other boys burst out in a quiet applause. Then there was total silence and they all went to sleep. It was the most incredible thing. I kept thinking what an amazing group of good men and boys were gathered there. Yay, Scouting!!! Good Morning…there are a lot of eyes on you today! 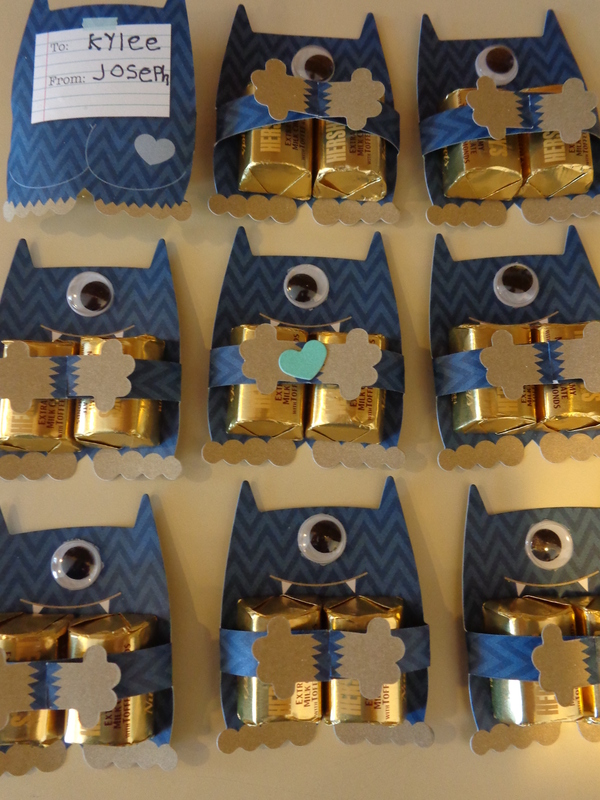 While Joseph has been home from school this week, he has made these little guys from a Stampin’ Up! kit. He still has to add all the hearts, but aren’t they cute. 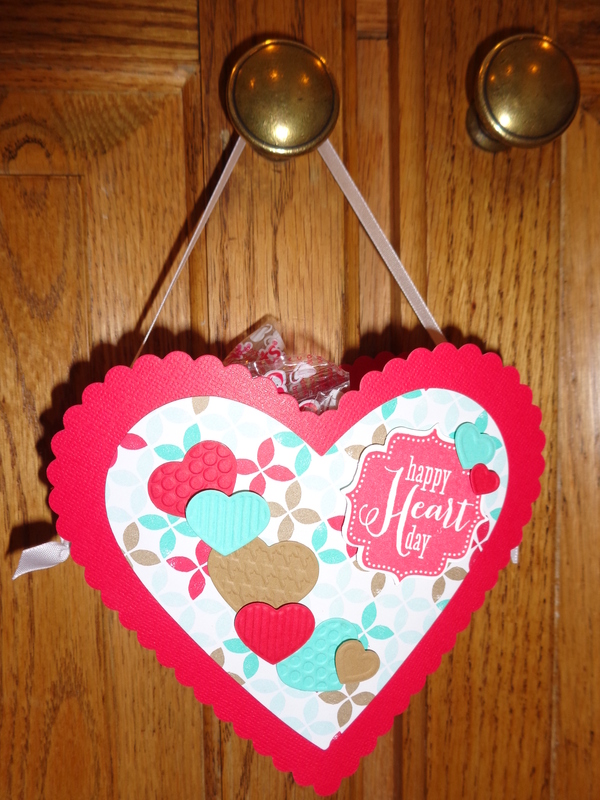 : ) The kit comes in blue or pink, and makes 18 Valentines. A great project for all ages! Hope you have a nice week-end. We’re off for an overnight at Maine Maritime Academy for the annual Boy Scout Klondike. Yay, frozen fun!